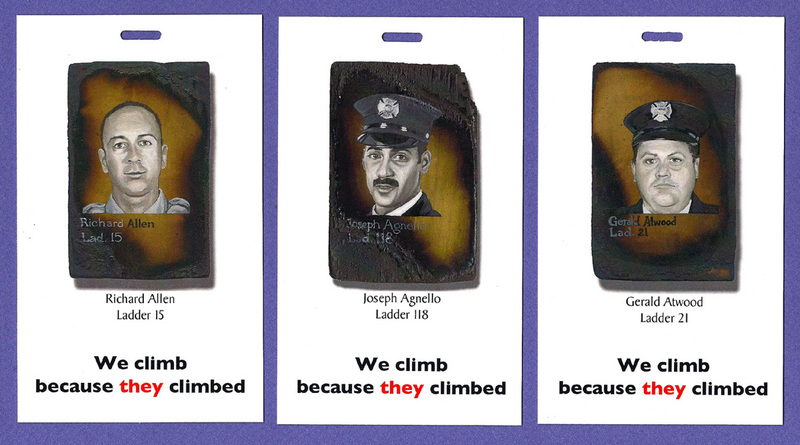 We are close to the season when most of the 9/11 Memorial Stair Climbs take place. These truly amazing events continue to grow in popularity. Memorial Stair Climbs were born on September 11, 1995, when five firefighters in Denver decided to climb 110 flights of stairs to honor the 343. (Around the same time, 25 miles away in Boulder, I had begun burning and preparing the blocks of wood to begin the Better Angels paintings.) In 2010 the Denver Climb partnered with the National Fallen Firefighters Foundation to create a template for other cities and fire departments to create their own Climbs. Since then Stair Climbs have spread across the country and around the world. These days the Denver Climb reaches its cap of 343 climbers within a couple hours of opening up its registration. The money raised from these events benefits the many support programs of the NFFF, including their continued support of the Counseling Services Unit of the FDNY. For info go to: 9-11stairclimb.com. Some Climbs also fund other charitable organizations that support firefighters and other first responders. Some of the Climbs are open to the public, such as the Climb at the spectacular Red Rocks Amphitheater in Golden, west of Denver. For firefighters the Climbs (which are not a race!) are used as fitness training and high-rise fire incident training. In some Climbs, firefighters wear their full turnout gear. Other Climbs have been expanded to include police and EMTs to also honor the 60 police, 8 EMTs and other volunteer firefighters not members of the FDNY who died helping people on 9/11. Even if you are not a Climber, you can volunteer to help, or donate to their coffers. 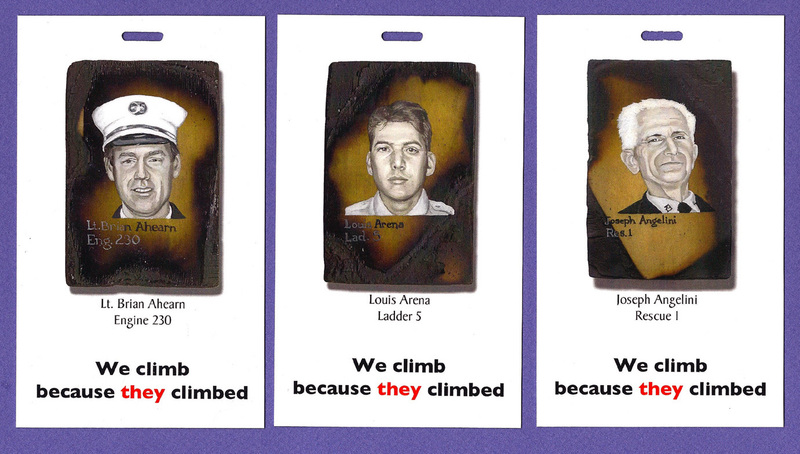 It’s easy to find a Climb near you through the NFFF website or at 9-11stairclimb.com. Thank you to Dallas, Charlotte, Tucson, San Antonio, Lancaster PA and Clayton MO for using Better Angels name tags this year. Their support helps me keep the paintings insured and safe. I will post pictures here and on the BetterAngels911 Facebook page when I get them. Meanwhile, starting this weekend and continuing for many months, I will be posting the 343 paintings one, two and three at a time on the Better Angels Facebook page organized by unit and company, adding links where they exist to the websites and FB pages of the individual FDNY Fire Houses. I welcome feedback and comments from readers. This entry was posted in 9/11 Memorial Stair Climbs and tagged 343, 9/11, 9/11 Memorial Stair Climbs, better angels, Charlotte, Clayton, Dallas, Dawn Siebel, Denver, FDNY, firefighter, firefighters, firefighters of 9/11, Lancaster, LODD, memorial, NFFF, paintings, San Antonio, Stair Climb, Tucson, World Trade Center, WTC. Bookmark the permalink.